Of all my travel experiences, camping in the Sahara Desert was one of the best things I’ve ever done. It was unique, memorable, exciting and adventurous but it was also affordable and actually quite an easy tour from Marrakech. There are lots of tours you can choose from and most of them will pick you up from your hotel and take care of everything for you. You could opt for a budget one (which is what mine was!) or go for a more luxurious glamping experience! Whatever you do, it’ll definitely be a once-in-a-lifetime trip and I can’t recommend camping in the Sahara Desert enough. Here’s a budget-friendly 3-day, 2-night desert safari for less than £100. It includes one night in a bedouin camp in a private tent and one night in a hotel with loads of activities too. Anyway, let me tell you about my Sahara Desert camping experience! We all collapsed into a fit of hysterical/nervous giggles as we laughed at how ridiculous that sounded. Then the laughing stopped as suddenly as it started when we realised it just might be true. I’m still not sure if our drivers were teasing us or we were genuinely lost but I’m sure we passed the same sand dune on more than one occasion! I have no idea how you differentiate one sand dune from another but the surrounding sand dunes were beginning to look worryingly familiar. There were two 4x4s driving to our camping spot which was about an hour into the desert. After an hour of all the ups and downs and swerving around huge dunes we’d lost the vehicle in front and were in a frantic hurry to find our little camp site before sunset. We’d been promised that sunset in the Sahara Desert is one of the most spectacular sights on earth so we had high expectations and didn’t want to miss it. I was on a weeklong tour around Morocco with Intrepid Travel and I already knew that camping in the Sahara would be the highlight of the trip. I grew up in Wales and I’m a country girl at heart so I love being in the great outdoors. My usual camping trips involve mountains and lakes, an inevitable burst of rain and eating burnt sausages from an instant BBQ, so I wasn’t sure how this would compare. But let me tell you, camping in Africa is something else. The day started on a high with a camel ride across the Moroccan sand dunes to take us part of the journey to our camp. The camels heaved us over giant dunes as we perched nervously on their humps. The trick to riding a camel is to go with the movement of their jerky steps. You’ll find yourself lurching forwards and backwards as you hold on for dear life while clenching your thighs to their sides. It may not be the most comfortable journey but it’s definitely an interesting workout. Camels are slow, gentle animals and you can’t help but fall in love with their relaxed attitude and those massive eyelashes. After an hour of riding we swapped our camels for 4x4s and sped over the dunes to our campsite. It felt like a miracle when we finally saw our traditional tents waiting for us in the distance. We reached our camping spot just in time to watch the sun set into the desert and we raced up the nearest sand dune to watch Mother Nature’s show. Our chatty group that had barely stopped talking since we met in Marrakech was silenced for the first time all week. And with a view like this, who could blame us. There wasn’t a single sound for miles around and it felt like we could have been the only people in the world. The warmth in the sand disappeared the moment the sun went down so we raced back down the dunes to our traditional woollen tents where we huddled together to keep warm and drink sweet mint tea. The tents were basic and had gaping holes in the sides which we found provided perfect windows to look up at the stars. It was quite possibly the most magnificent view I’ve ever seen. There were so many twinkling stars above us that the sky didn’t even look dark. The Milky Way was a shimmering silver streak across the sky while shooting stars darted across it like diamonds. We dragged our sleeping bags and blankets out from our tents and lay in the soft sand to admire the view while making countless wishes on the shooting stars. Moroccan tagines were served for dinner as we sat cross-legged in the tent around a steaming pot of delicious cous cous and vegetables. We sat there for hours; talking, laughing, telling stories and drinking sweet tea by candle light. Tahar, our guide, turned out to be a great storyteller as he recalled his childhood memories growing up with his nomadic family in the desert. Tahar didn’t leave the desert until he was 8 years old and had only ever met other nomadic families so he had no idea there was a whole world out there. I remembered how I’d felt up on that sand dune where it seemed like the desert went on forever. It felt like there couldn’t possibility be other people out there, never mind cities or lakes or seas. He touched his face and his skin to indicate that he’d thought that the whole world looked like him, spoke like him and lived like him. I couldn’t image what a shock it must have been to discover how big the world really is. He told us he was a naughty child and didn’t take well to nomadic life. He was useless at looking after his father’s goats and always lost them so his father sent him away to school. He’d been brought up speaking a dialect known only by nomadic families so he struggled to learn anything at first but now he speaks 8 languages! He began working in hotels and gradually moved into tourism until he became the amazing tour guide that he is today. This post was originally published in 2013 but has been updated. My camping experience was included in a tour with Intrepid Travel. I took this tour when I worked at Flight Centre and it was part of a FAM trip. This is a familiarisation trip for travel agents (I worked in social media but somehow managed to wangle my way onto the trip!) 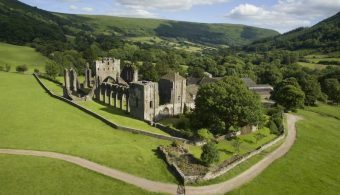 You could book individual tours if you prefer independent travel. Oh wow love your photos, I did something similar when I stayed near the Red Sea and it’s definitely an experience that stays with you! I’d love to do it again so maybe I should put the Red Sea on my list! Very impressive! My wife did the “desert sleeping” in Egypt and she loved it, I believe it’s my turn now. We both love desert, and camales are so lovely animals. They really are gorgeous in a really grumpy, old-manish kind of way. If you ever get a chance at doing something like this you should definitely try it! It looks gorgeous out there! It’s nice occasionally to be just in the middle of nowhere like that. No noise, no light pollution, no mobile phones. It’s so true. I don’t even remember the last time I sat around at night, drinking tea and telling stories. I think I need to switch my phone off more often because it was a lot of fun! Haha, that’s a brilliant idea. Much more fun that spin or Zumba! 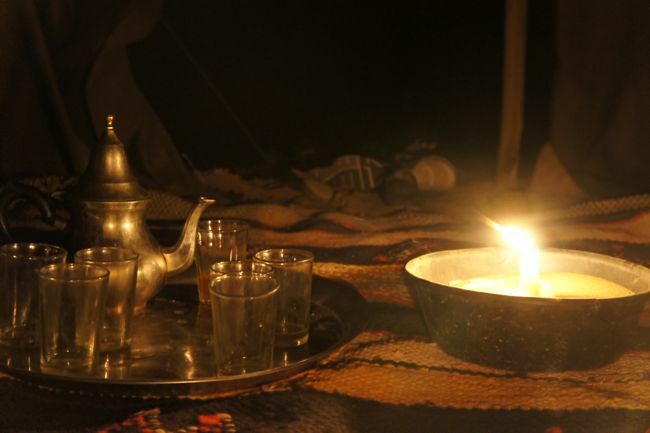 We camped with Bedouins in Wadi Rum, Jordan and absolutely loved it! Though we didn’t love the camel trekking part. We trekked for about 3 hours or so and both had some pretty bad chaffing from doing so. Ouch, yes I can imagine that you’d be pretty sore after 3 hours. At first I thought that an hour on a camel wasn’t long enough but I was more than happy to get off at the end! Love the orange color of the sand in the early morning! Definitely a view worth waking up to. It was one of the best views I’ve woken up to! You can’t beat a good sunrise. It’s always tough to get up for but well worth it. 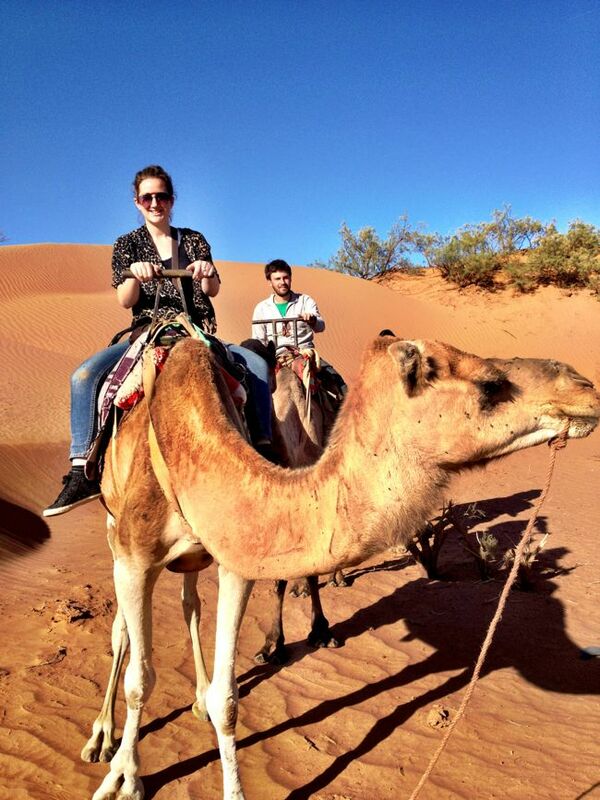 Hey Monica, we’re excited that you had such a great time in Morocco and we’ve loved reading about your adventures. It’s certainly a thrill feeling like you’ve left the real world behind and spending a night in the most amazing camp. Needless to say it might seem like our guides are going around in circles, but people who are are born in the area, like your driver Tahar, have an uncanny knack of safely negotiating the shifting sand dunes to reach the desert camp – also in case anyone feels a bit anxious about being cut off from contact with the outside world, there is phone reception and our drivers have two sim cards so they can always get help if needed. Hi Sue, thanks so much for your comment and clarifying that we probably weren’t lost at all, it’s just all about finding the safest place to negotiate those massive dunes! And please thank Tahar for being such an amazing guide and storyteller! This sounds like a perfect weekend away. 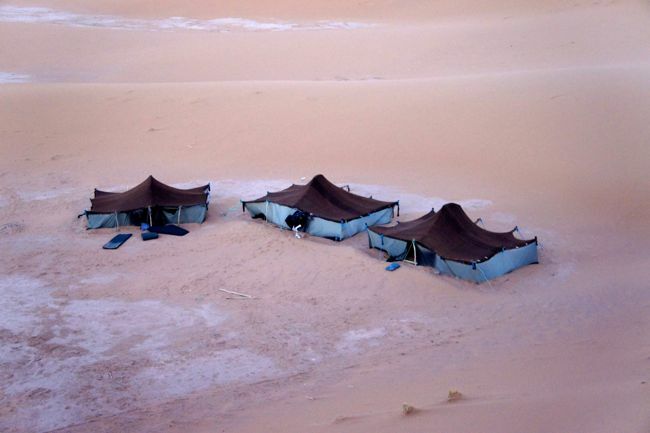 The Sahara and the tents and the tea and the guide with all of his stories. We went to Mongolia a while back and this reminds me of the steppe experience we had there. Freezing cold nights in cosy tents with the most beautiful starry skies I’ve ever seen. The silence at night was almost deafening. I’ve never felt so free and/or alone in the world. That’s true, there is something quiet lonely about the silence but it’s lonely in a peaceful, refreshing way rather than a sad way. Wow! What an amazing experience that must have been. I would love to go someday- riding a camel in the desert is up there on the “things to do” for me, how cool! I’ve spent many nights as a kid sleeping under the stars in the Australian desert, so know why you would like it. Has been a long time since I’ve done it though! I remember plenty of sand in everything! What a fabulous experience!! I would have been terrified, excited, amazed and awestruck – probably all in the same moment. Thanks for the post, I feel almost like I was there (without the sand). Love the camel! What a great adventure you have there!! I can image. I’d love to see the pyramids but you’ve just made me realise how lucky I am to be somewhere so quiet and peaceful. Beautiful pictures and what a fun experience! It reminds me of camping in the Wadi Rum in Jordan. Nothing like the desert as a backdrop for a night looking at the stars, ey?! What a great trip. I read somewhere that is gets very chilly at night in the desert, and i can see evidence of this from the last shot. Thanks for sharing your Lovely story here!! My husband and two adult sons wanted a different holiday experience this year and decided to visit Morocco. We’ve lived in Europe and traveled extensively, but none of us knows North Africa. I discovered ( Marvelous-moroccotours.com ) online and sent a note explaining what we were looking for. Iddir’s responses to all my emails were thorough and amazingly timely. His recommended itinerary was perfect. We particularly enjoyed the desert camel ride and bivouac under the stars, and visit with a Berber family–really unique experiences we would not have found on our own. Our driver Said was the best, always attentive and willing to adjust to our needs. Iddir knows his drivers, tour guides and recommended riads and restaurants well. he is the best travel agent I’ve ever worked with, by far. 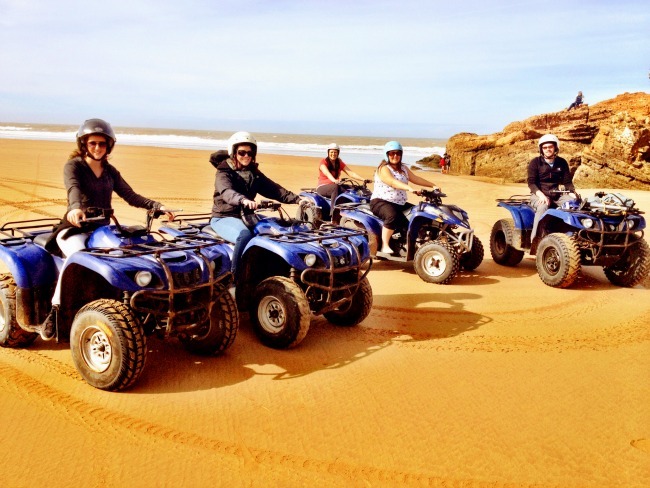 My family has highest recommendations for Marvelous Morocco Tours!! Great story and photos! Out of curiosity, what was the name of the Intrepid Tour that you took that included this activity? That’s Ray. It wasn’t an Intrepid tour that members of the public could take. It was a fam trip (familiarisation trip for people who work in the travel industry) so it was a combination of a few trips to see the highlights. Hello, I’ve done a lot of research about going to a Sahara desert camping trip and have learned a lot about it. The one thing no one has wrote about is what to take with you on that part of the trip. Do you leave all your luggage at your original hotel in Marrakech? Can you take it with you? 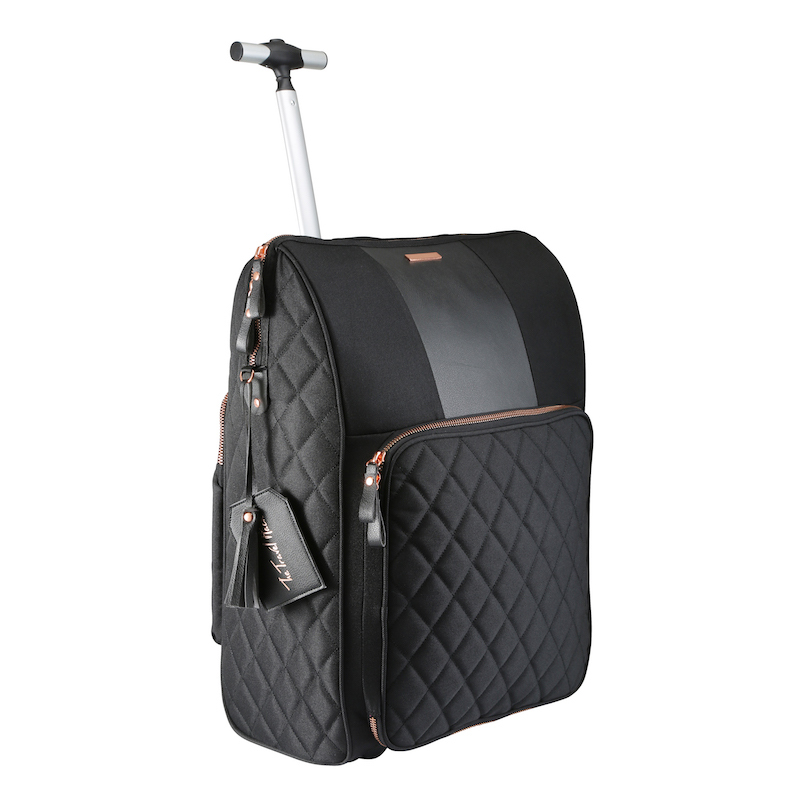 Or can each person just carry a backpack with them? What should I definitely pack? Thank you for any information! Hi. We were able to leave our luggage in our original hotel so I think most hotels will offer this service. You should definitely pack some warm clothing as it gets very, very cold at night. I’d pack a hat and some warm socks, a hoodie and even an extra blanket if you have it. And then in the day it will be very hot so clothing and skin care to protect you from the sun. And your camera of course! Hi Monica! Do you have recommendations as to which companies to book through? Most companies that I seem to find are luxury only with luxury price tags. Looking to do a 2-3 day tour and not brake the bank – any advice is appreciated! Thanks! My tour was through Intrepid and I’d definitely recommend them. They have a sister company called Urban Adventures who do short tours so they might be worth looking into as well! I hope you find something, it’s an amazing experience.